British Columbia wines will be available in grocery stores starting next spring, under new rules announced Friday in Langley. 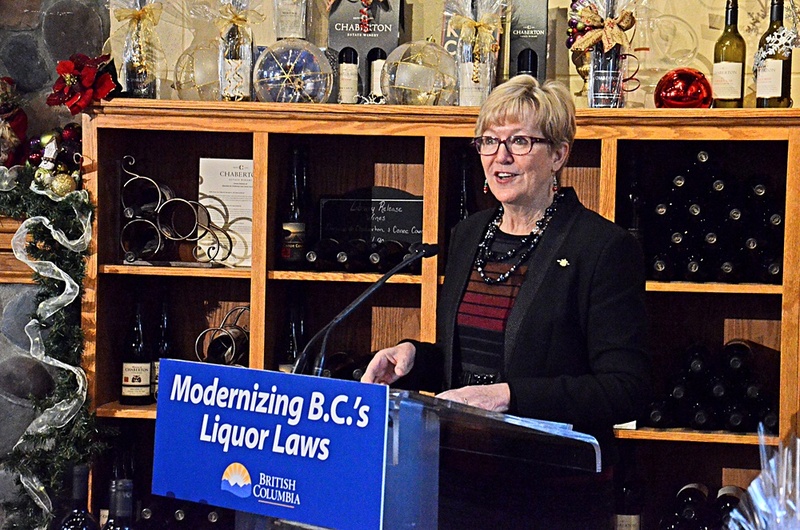 Attorney General Suzannne Anton said that grocery stores will be able to purchase licences to sell wine, but only if it is 100 per cent B.C.-produced. This wine will be available in the grocery store at large, rather than through the store-within-a-store liquor store model already announced. â€œThere will be a number of new licences,â€ Anton said, but she said the number will be small. That means most licenses will come from existing VQA and independent wine stores. Independent wine stores can currently sell a variety of wines, but if they transfer their licences to a grocery store, the new store will only be able to sell B.C. wine. The change will go along with a shift in pricing that Anton described as creating a level playing field. Government and private liquor sellers will soon all be buying at the same wholesale price, Anton said. That means the end of an effective 30 per cent discount that independent stores had enjoyed. The attorney general said it will be up to retailers to set their prices at the till. Anton emphasized the convenience of the new model for people shopping for wine. â€œThey can pair their fish or steak with their wine right there and take it home,â€ Anton said. The new licences will be restricted to larger grocery stores, so wine wonâ€™t be available at small corner stores. A designated till staffed by someone over 19 will be in place at such stores for wine purchases along with other items. The announcement was made at Langleyâ€™s Chaberton Estate Winery, one of the oldest wineries in the Fraser Valley. â€œAs a winery using local grapes, weâ€™re excited to be part of this change, and look forward to seeing this new market create more places where we can make our wines available to British Columbians,â€ said Chaberton co-owner Eugene Kwan in a statement.